On October 13th, 2009 we found out that our unborn baby, who we now know as Michael Jesse, was diagnosed with Bilateral Renal Agenesis, otherwise known as Potter's Syndrome, a fatal condition. 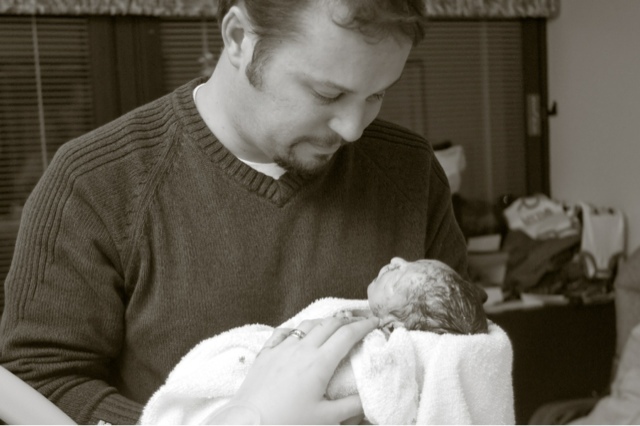 Michael came into our world and left for heaven on January 22nd, 2010, but not without impacting hundreds, perhaps even thousands, of people by his short, little life. Michael was the gift God brought into our lives in room 316. Our desire for this blog is to bring glory to God for knitting together such a beautiful life. You will find the journey which we have been on since October 13th, 2009, with all of our prayer requests and our personal reflections. The story of this journey has not ended, for as Michael dances in Heaven, we await to be reunited with him in glory. The Haven Network - A Perinatal Hospice based in Rockford, IL. Bella Vie Studio - Kristin was our amazing photographer who did our pregnancy shoot and was there to take pictures of Michael’s birth to help us remember his every feature. She did this as a service through Now I Lay Me Down To Sleep and we are forever grateful for this ministry. Living Grace Community Church - Our church home through whom God used to serve us with meals, cards, encouragement and love through our journey of grief. Kahle Moore Funeral Home - Steve Moore’s professionalism, sensitivity and care helped us during a very difficult time. The Grace Effect - The original home of Michael's story and Daddy's ongoing place of thoughts and testimony. "Mom, how many minutes until we go home?" "You know, until we go home to heaven to see Michael?" Words spoken by our six year old this morning while snuggling in bed with mommy on Michael's fourth birthday. Every year we try to celebrate as he is celebrating. We think up a fun family activity to do on or around January 22nd - bowling, eating ice cream for dinner, spending a fun overnight in Chicago, going to a waterpark - but it just won't ever compare to the fun he is having in heaven. For his is a year round, daily celebration of the Lord's grace. Michael's celebration never ends and he never gets tired like we do. He never gets bored with celebrating his eternal life through Christ. Yet with every minute that ticks by we long to be there. "How many minutes until we go home?" And so we will number our days and we will number our minutes, knowing that God will provide wisdom on how to persevere through evil and difficulties. Knowing that our "temporary, light affliction is producing for us an eternal weight of glory beyond all comparison." (2 Cor 4:17) That He will make us infinitely more glad for an eternity compared with how we have suffered through grief in this momentary life. And as we trust in Him, we will continue to point our children to the God of all eternity - the God of the minutes and the days and the thereafter - "for a thousand years in [His] sight are but as yesterday when it is past, or as a watch in the night." We continue to love you, Michael. We celebrate with the fun as you would have wanted, foreshadowing the incredible, infinite fun and celebration we will one day have together with all the saints. I love you, son. We're only "minutes" from home. Two years ago today I experienced the most peace and sadness in all my life as time seemed to stand still for me. While many saints were on the steps of the supreme court protesting for the right for unborn babies to live, our Michael was being carried to heaven to live a healed life with God. We were advised to abort Michael at 20 weeks, but I'm so thankful to God for allowing me to experience both the peace and sadness, the stream and the desert place all at once at his full term birth and death. It is really amazing to fall completely helpless into God's arms and to have God lovingly strengthen you when you have no strength. This is peace that surpasses my understanding and it is a glorious place to be. Michael's life cannot be separated from the fabric of our lives that God is weaving together. I miss him - he's my boy. But I will remain steadfast in my hope to see him again anew. "I miss him, and this makes me sad"
Words spoken from our 4 year old reminds me that children can have a huge emotional capacity and an understanding of things that oftentimes surprise me. This 2nd anniversary marks the day that our world came crashing down - October 13th, 2009. A few days ago we took advantage of the beautiful weather and went on a bike ride to what our kids lovingly call, "Michael's Park" - the cemetery where Michael is buried. We sat by his stone for a long while. Lately, when we have visited Michael's grave, Will lays his whole body on top of Michael's stone and puts his head down. I marvel at his level of grief. Maybe because he is doing something physically that I want to do, but don't, for fear of someone seeing me. Oh the complexities of adulthood compared to the simplicity of children. I'm having a hard time wrapping my mind around time. Has it really been two years? And to Michael, how long has it been? A second? A 1000 years? What's life like up there, son? In the words of a child, "I miss him, and this makes me sad". We were recently interviewed by a reporter who was writing a story on grieving the loss of a baby. She was specifically doing a story on the organization Now I Lay Me Down To Sleep - an organization that helped us remember Michael through photographs. In all things, God is in control. On Friday, January 22nd, 2010 we woke up preparing for what was to come at 5pm on Sunday, January 24th – the scheduled time for inducement of our son whom we knew was going to die. God showed us His control when on the day that marked week 36 of the pregnancy (Friday, not Sunday), He called Michael Jesse home. God showed us His control when He arranged for our delivery doctor to be the same doctor who had encouraged us to abort this baby at week 20. God showed us His control when He planted within our hearts a peace that surpasses all understanding and for us to be able to now say that the most peaceful day of our lives was January 22nd, 2010. God showed us His control as He continues to place people in our lives to minister to in similar situations and to give testimony of His goodness that can be seen through faith and trust in the midst of trials. In all things, God is in control. And even while I say that January 22nd was the most peaceful day in my life, I can also say that it was the saddest day in my life. Where temporal meets eternal is an incredible view into the face of God and the grace He gave to Summer and I that night and those who were present is a grace that we do not take cheaply. There are costs involved and while we did not choose to suffer these costs, we accept them with hearts open to seeing what He will do and has done for His glory and for our good. There is still grief. Our arms and hearts still ache. We cannot know when the aching will stop. Perhaps not until we hold Michael again in heaven. Grief has changed over this year and it has changed us, yet there is no way to measure this change. We live a new normal. When asked how we are going to do this weekend with the anniversary, we do not know how to answer. Is this just another day? Or is it something else? How are we supposed to feel? What are we supposed to do? We do not know. All we know is that God will supply all that we need to be completely satisfied in Him. We need nothing else. All will fall into place as we trust his control and His hand on everything. And this control is wrought out of love for us, and that itself cannot be measured except by the cross which bore all for all, and the hand that holds Michael's hand now. One year ago. Excitement. Camera. The Kids. The Plan. Shock. Tears. Impossible. Hands. Listening. Questions. Choices. Decision. Raw. Picture. Word. Him. Weeping, not sleeping. Fear. Anger. Devastation. Searching. Surreal. Reality. Valley. Help. Friends. Family. Jesus. Rock. Weeping lasts but for a night, yet joy rises in the morning.